Bratswurth or brats are easy to grill, but there are different types of brats. 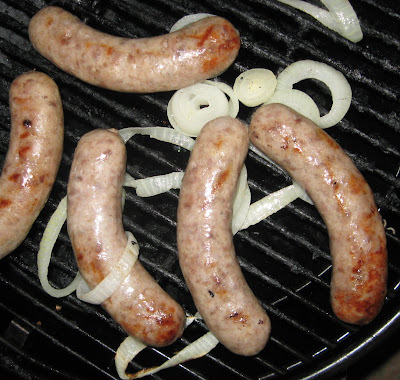 See my brats guide at Yes You Can Grill if you don't know your sausages. Our favorite brats are the raw type which take longer to prepare but really taste great. We get Johnsonville Brats or the Food Lion brand but uncooked. If you're not sure if the ones you're looking at are pre-cooked or not, just ask the meat guy at the grocery. Since we get uncooked bratswurth to grill, we simmer them before putting them on the grill. Just put the beer, butter, and onion in a pan on top of the stove and heat until the butter is melted. We like to stick holes in each end of the brats with a fork. If the casing is intestine, then it will absorb. But, it seems to give more flavor to add a couple of holes to the casing. Also, it helps keeps the brats from squirting on you when you bite in later. Some people like all that meat juice. Some people (like me) hate to get brats burn. Simmmer the brats for 20 minutes at medium or 45 minutes or so on low on top of the stove. I tend to go with the low temp and get other items ready for the cook out as the brats slowly cook. Remove the brats and then put on the grill. With the simmer beforehand, you grill these sausages just like hot dogs - until hot and with grill strips. Very easy. Serve on brats buns or sub sandwich buns with mustand (bold is good). This is another of my super simple recipes, but it sure is good. I have people ask me my secret for making such delicious grilled brats. So, there it is. For whatever reason I have never grilled brats...maybe because my wife doesn't like them. But, maybe I'll sneak them in anyway! If you do the brats like this, she might like them. I've converted a couple of people who didn't think they liked them. You can't really taste the beer, but it gives them a really nice flavor off the grill. 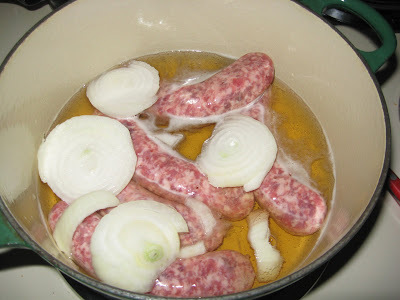 Place beer brats in an aluminum pan with beer, onions, green bell peppers, real butter and horseradish. Simmer on grill for 30 minutes then transfer brats to grill for 20 minutes. At last, place back in pan for 5 more minutes. Serve on buns using onions and peppers from the pan. Yellow mustard is also good to add.